Big Walnut Friends Who Share volunteers and friends gathered at the new Friends Who Share Center’s location at Sunbury United Methodist Church last Monday evening to hold a ribbon cutting ceremony. From left are Assistant Director of BWFWS Center (Board Member) Beth Jewell, Sunbury United Methodist Church Trustee Chair Bill Stroud, Sunbury Big Walnut Chamber of Commerce Board President Cindy Erndt, Sunbury Mayor Tommy Hatfield, Mayor, BWFWS Board President Larry Tornes, BWFWS Board Vice President Marsha Garee, BWFWS Founder Barb Jeffers, SUMC Pastor Mike Mack, BWFWS Center Director Gene Wampler, BWFWS Recording Secretary, Corresponding Secretary, and Board Secretary Cathy Cantrell. 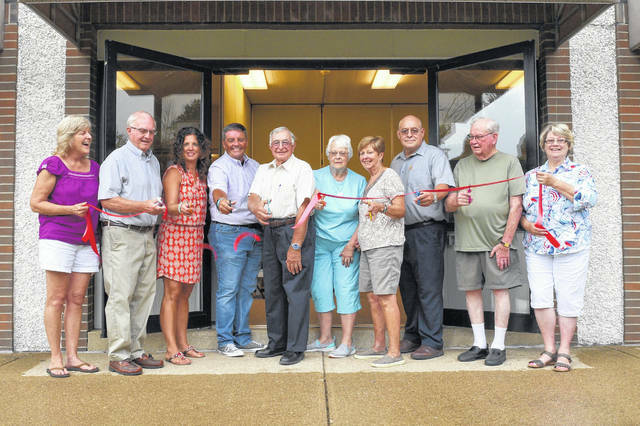 Eastern Delaware County’s grass roots social service agency, Big Walnut Friends Who Share, recently opened the doors at its new location on the lower level of Sunbury United Methodist Church at 100 West Cherry Street in Sunbury. Today when you say the words Big Walnut Friends Who Share to eastern Delaware County residents think of a local institution that’s been around almost forever. But Barb Jeffers started Friends Who Share as a community-based all-volunteer family assistance organization only 27 years ago out of a single car garage at her home. When Friends Who Share outgrew Jeffers’ garage they used the old IGA building on Harrison Street; then Dr. Michael Anthony’s basement on Vernon Street was home base. Big Walnut Friends Who Share then operated out of a facility on High Street near the intersection with Hartford Road. Several years ago Friends Who Share moved to a smaller space at Vans Valley Church east of Sunbury and the search began for a larger and more permanent home. That search ended with the move to Sunbury United Methodist Church. Friends Who Share President Larry Tornes said the new SUMC location would better serve clients in the greater Big Walnut Local School District community. SUMC Senior Pastor Mike Mack was present to welcome Friends Who Share during a brief ribbon cutting ceremony. Big Walnut Friends Who Share, a member of the Sunbury/Big Walnut Area Chamber of Commerce, is now located at 100 West Cherry Street at the lower level, southeast side parking lot of Sunbury United Methodist Church. The Big Walnut Friends Who Share Store is open to those in need on Wednesday mornings from 9 until 11:30 a.m., and during the evening on the second and fourth Tuesday of each month from 6:30 until 8 p.m. On the second Saturday of each month, senior citizens can visit the Friends Who Share Store from 10 a.m. until noon. To volunteer, to donate needed items, or to make a financial contribution to Friends Who Share projects, call 740-965- 9596. Cash donations may be sent to Big Walnut Friends Who Share, P.O. Box 424, Sunbury 43074. Big Walnut Friends Who Share can be found on the Internet at bigwalnutfriendswhoshare.org. https://www.sunburynews.com/wp-content/uploads/sites/48/2018/08/web1_BWFWS-7_16_18-240.a-Ribbon-Cutting.jpgBig Walnut Friends Who Share volunteers and friends gathered at the new Friends Who Share Center’s location at Sunbury United Methodist Church last Monday evening to hold a ribbon cutting ceremony. From left are Assistant Director of BWFWS Center (Board Member) Beth Jewell, Sunbury United Methodist Church Trustee Chair Bill Stroud, Sunbury Big Walnut Chamber of Commerce Board President Cindy Erndt, Sunbury Mayor Tommy Hatfield, Mayor, BWFWS Board President Larry Tornes, BWFWS Board Vice President Marsha Garee, BWFWS Founder Barb Jeffers, SUMC Pastor Mike Mack, BWFWS Center Director Gene Wampler, BWFWS Recording Secretary, Corresponding Secretary, and Board Secretary Cathy Cantrell.